iPhone X / 8 / 8 Plus, Samsung S9 / S9+ / S8 / S8+ / Note8/ S7/ S7 Edge/ S6 / S6 Edge+, and all Qi-enabled or Qi receiver-equipped devices. Note: Charging time tested at 71.6 °F – may vary as temperature increases. Does not charge Apple iWatch. 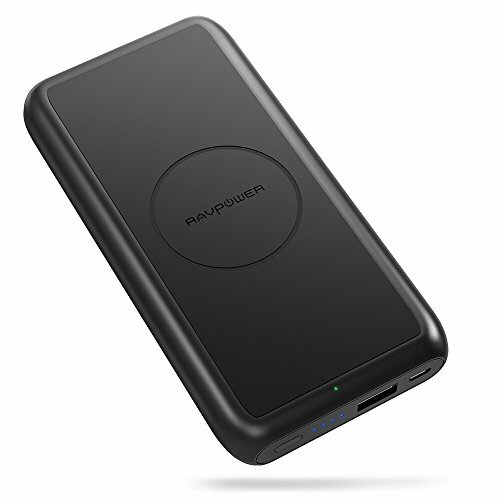 When the battery is lower than 25%, wireless charging won't start; please recharge over 25% and press power button to reactivate wireless function. Do not wireless and wired charge the same device simultaneously.